Smartphone Fanatics: Wow! 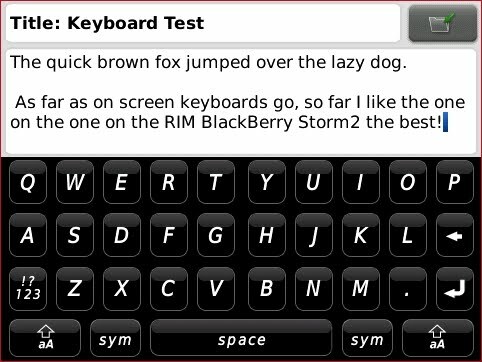 I Like the Storm2 On-Screen Keyboard! "After using the Storm 2’s Qwerty keyboards, I can say that I prefer the landscape keyboard the most. It offers the largest key cap clickable area of all the keyboards and the clickable screen did a good job tricking me into thinking that I was pressing a key on a physical keyboard. That isn’t to say that I didn’t make any typing mistakes, but I think that the Storm 2 offers the best on screen keyboard of all the smartphones I’ve tested so far. My one basic gripe about the landscape Qwerty keyboard is that when it is displayed, it takes up a significant portion of the screen; which can severely limit the space on the screen to see what you are doing." Now that I have to live with the Storm2, I'm glad that to see that my views haven't really changed much about the keyboard and that I still find the Qwerty landscape keyboard the most useful of all of the virtual keyboards I've tried to date. I've also been working with the Motorola Droid lately. You can get used to the Droid's flat keyboard (as compared with a raised keyboard on the BlackBerry Tour/Bold or the Palm Pre); however, I have discovered that I can type faster on the Storm2 because the on-screen key caps are larger than the physical key caps on the Droid. The punch line here is that I still stand by my years long assertion that buying a smartphone is a very personal choice. you can read reviews and get recommendations from people, but at the end of the day, I still think the best thing you can do if you are in the market for a smartphone is to go to a local retail store and play with the selections and try it out for yourself.